Ahead of today’s Apple event, where it’s expected the company will officially introduce the next version of Apple Watch’s software, watchOS 2, among other things, app store analytics firm App Annie has released new data on the status of the Watch App Store today. Specifically, the company finds that there are now 11,469 Apple Watch apps live in the iOS App Store. That’s a notable increase from the 6,352 apps it found in June, and the 7,567 in July. While some of these early apps have struggled with how to best take advantage of the small, wrist-attached screen (and it’s arguable that not all apps need a Watch counterpart), the proliferation of apps in a relatively short time does indicate the strength of Apple’s developer ecosystem. Developers’ willingness to experiment with new platforms and Apple devices as soon as they become available has allowed this third-party ecosystem to bloom and fill with content for the Apple Watch user base to test out. Somewhat surprisingly, App Annie found that the category with the largest number of apps was “Games,” which seems odd given that gaming on the wristwatch’s tiny screen is not an ideal experience – especially when Watch owners already have an iPhone in their pocket, as Watch has been a companion device, not a standalone piece of hardware. Following gaming, which included 1,412 Watch apps, the next largest category of apps is “Utilities” (1,243 apps), which seems more reasonable. It makes sense that users are trying to customize their Watch with apps that help them more quickly get things done, or that only require brief interactions, instead of forcing them to pull out their phones to accomplish the same tasks. 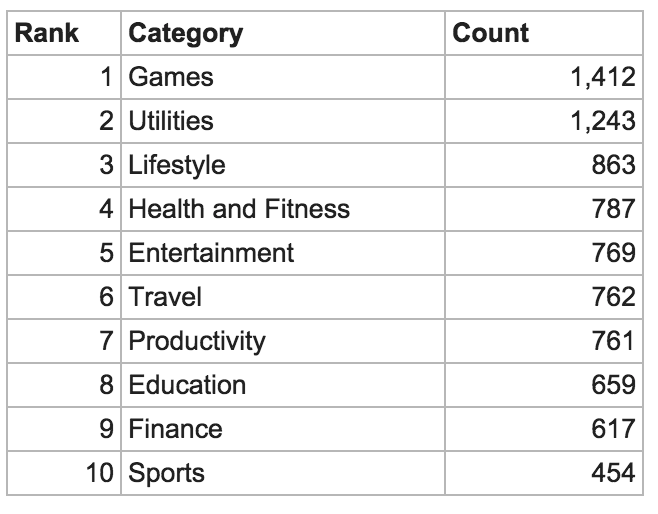 Rounding out the rest of the list are “Lifestyle” (863), “Health and Fitness” (787), Entertainment (769), Travel (762), Productivity (761), Education (659), Finance (617), and Sports (454). It’s interesting that, at present, the breakdown of Watch apps by category somewhat mirrors that of the larger App Store which is also heavy on gaming. That’s in part because Apple Watch apps are packaged with the iOS release, which means it’s not too difficult for a developer to extend their current app or game to the watchOS platform. But it also speaks to the limitations of the current watchOS platform – it’s as if developers are simply trying what worked before on other iOS devices and hoping for the same results. But while there may be plenty of Watch-enabled gaming or shopping apps to choose from, the apps actually getting used are likely more of a utilitarian nature – pinging you with important or urgent information, or allowing you to track a fitness or health goal, for example. In other words, those apps being built don’t necessarily reflect what’s being used, but that’s data that’s not yet available. All that being said, Apple Watch is just getting started. With the launch of watchOS 2, developers will be able to run apps natively on the device, which increases performance and the speed with which they can access sensors. Developers will also be able to tie their apps and services into Apple Watch face complications, which could provide them with a more high-profile position on Watch screens. With watchOS 2, we expect to see new subcategories of Watch apps emerge that are working to tap into the device’s unique feature set. For instance, App Annie earlier suggested it could allow for apps that allow for body temperature reading or those that communicate via the Taptic Engine. The new OS will also bring increased developer interest in building for the device, as those who were waiting for the platform to mature some before diving in will now begin work on their own Watch apps at last. It’s expected that Apple will announce the launch date for the new watchOS 2 later today at its San Francisco “Hey Siri” event. Update: During the Apple event, the company formally announced “over 10,000” Watch apps were now available, which further backs up the App Annie report.